Tan Moh Hong Reptile Skin and Crocodile Farm (陈茂丰皮业鳄鱼饲养场, officially known as Singapore Crocodile Farm) was located along Upper Serangoon Road. Operated for more than 67 years, it was formerly the oldest crocodile farm in Singapore before its closure in mid-2012. Its premises, occupying more than an acre of land, is likely to be sold to a private residential developer in the near future. In 1945, shortly after the end of the Second World War, an entrepreneur named Tan Gna Chua (陈岳泉) decided to go into trading business of crocodile skins. He turned his residential home at Upper Serangoon Road into a reptile farm, which was the first of its kind in Singapore. Due to the unstable political conditions and a lack of restrictions in the country during that era, it was not uncommon that an exotic farm could be established in Singapore. At the start, around 10 crocodiles were breed in the pits with high bricked walls. As his business grew, Tan Gna Chua set up a skin-processing factory within the premises. The number of crocodiles increased rapidly, and Tan Gna Chua’s business was soon able to attract a large clientele. Its various reptile skin products, such as wallets and handbags, and crocodile meat were also exported to overseas. Tan Moh Hong Reptile Skin and Crocodile Farm was later opened for free admission to the public, a policy that remained till the day of its closure. 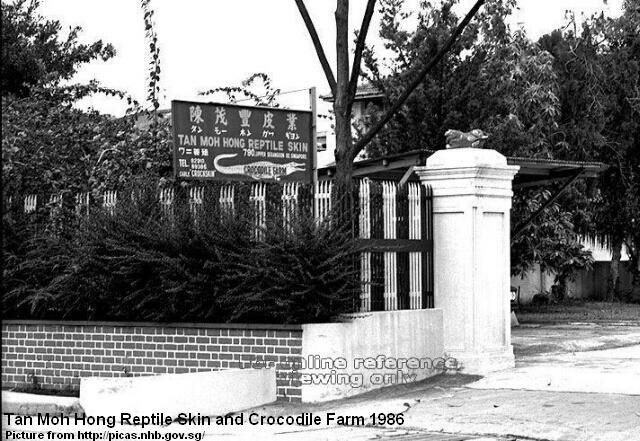 Despite operating for decades, many locals were not aware that there was a crocodile farm at Upper Serangoon Road. Even some of the residents living nearby did not realise the existence of this unique place. In 1972, Tan Moh Hong Reptile Skin and Crocodile Farm received much publicity in the media when Louis Mountbatten (1900-1979), the Earl Mountbatten of Burma, paid a private visit to the farm with his family. By the mid-2000s, Tan Moh Hong Reptile Skin and Crocodile Farm possessed more than 100 crocodiles of three to four different species. The interior of the farm largely remained the same for more than half a century, despite the rapid changes in its surrounding environment. It old signboard at the entrance, written in three languages of English, Chinese and Japanese, showed signs of aging with its fading colours and peeling paint. Tan Gna Chua passed away in 2000 at an age of 85, leaving behind an estimated $30 million worth of assets. The Tan family was later involved in a legal dispute between the children of Tan Gna Chua’s two wives. 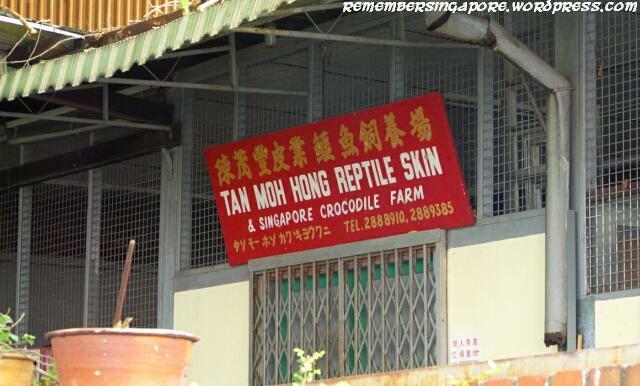 With the closure of Tan Moh Hong Reptile Skin and Crocodile Farm, there is only one such farm left in Singapore. 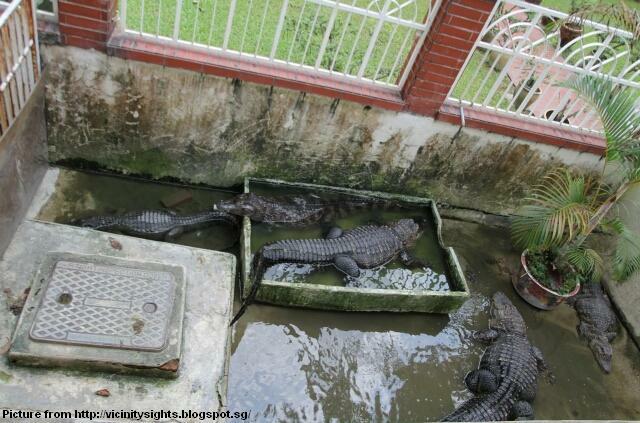 It is the 40-plus-year-old Long Kuan Hung Crocodile Farm (农光行鳄鱼场) located at Neo Tiew Crescent. Occupying a large compound equivalent to 12 football fields, the farm has currently more than 8,000 crocodiles and three major breeding ponds. Formerly the largest regional crocodile farm was Jurong Reptile Park situated opposite Jurong Bird Park. It was, however, shut down in 2006 due to bankruptcy. This entry was posted in Exotic and tagged Jurong Reptile Park, Long Kuan Hung, Singapore Crocodile Farm, Tan Gna Chua, Tan Moh Hong, Upper Serangoon Road. Bookmark the permalink. 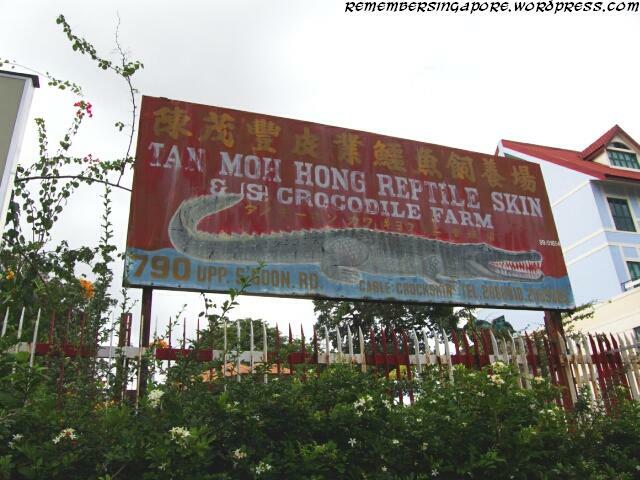 I just jogging past this farm 2 weeks ago and wanted to have a visit, but from the outside, it seem nobody is inside….then I suppose the farm is permanently closed..
AHHH… Tan Moh Hong crocodile farm… that signboard was something i grew up with as i was schooling near the area. We used to joke that we’d be surrounded by crocs if there was a serious flood. =P It’s really nice to know the history and what really happened. Thank you. I used to live near a crocodile farm that was beside Lorong Chuan near the outskirts of Serangoon Gardens, around the area where La Quinta Park (on Chuan Walk) has now been built. I was about 8 to 10 years old back then. My brother and I snuck out there once or twice to look at the crocs, but were warned away by the workers. One of them gave me a crocodile tooth. The area was prone to flooding during heavy rainstorms, and baby crocs would sometimes get loose during these times. I recall my neighbour chasing one with his remote-controlled speedboat, then capturing it and taking it back after the floodwaters retreated. Does anyone have any further info on that crocodile farm? I moved out of the area back in 1987. Before its closure, I used to go to the crocodile farm. I was scared that if I would fall in, I would become lunch! It was fun! so.. what happened to the crocs? Wasn’t there a crocodile farm in the East Coast area previously? The Singapore Crocodilarium at East Coast Parkway? I couldn’t find much info about it but I’m sure it’s not there anymore, or perhaps it wasn’t being built there in the first place at all!? But it has not been around for at least 10 years! Yes, i remember it was a single storey building made up of red bricks, but it was torn down more than a decade ago? In fact, one can still easily find the remnants of the Crocodilarium site as the carpark is still being preserved, though the buildings are gone. 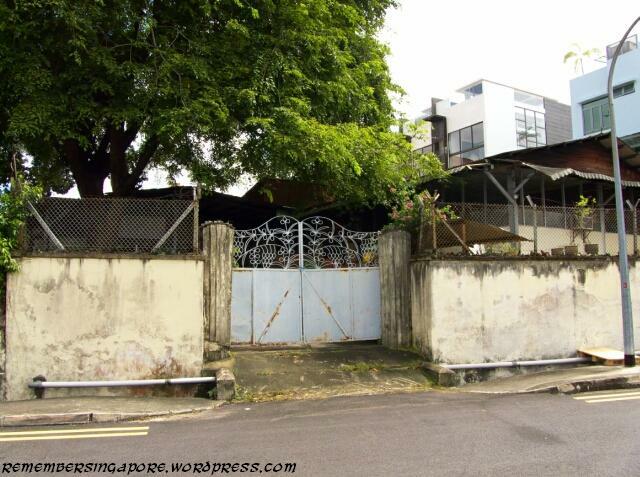 I stayed just opposite in kovan road and one day in my teens I decided to explores this strange house with a crocodile farm sign – from the front it looked like any other residential property. But once I got to the back it was like a trip back In time and the sight of the thrashing crocodiles was both exciting and thrilling. It seemed strange to have a such a place in a the suburbs. Tthroughout my growing years it was such an iconic building and signboard. 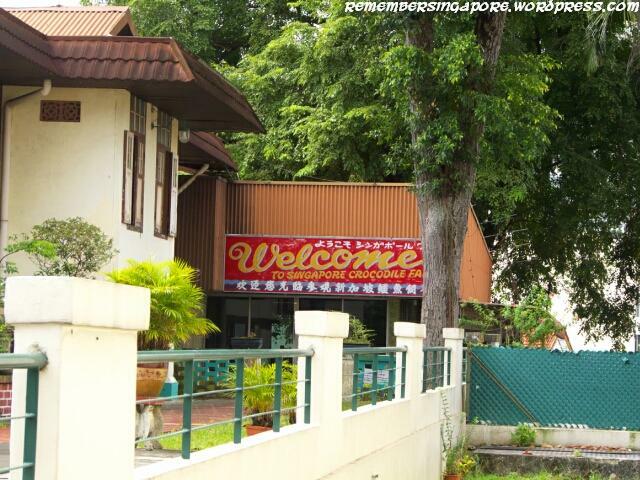 My parents still stay at kovan and I pass by the place many time on my visits home. I always wanted to pay the farm another visit for old times sake but I guess it’s too late now. only from ur website hav i realised its closed. i been there many times. And im disappointed tat my last trip was my last trip. I wonder how they transport the crocs away. Must be a grand event. Its generous of the owner to offer free entrance. The one at neo tiew crescent doesnt offer visits, and they are rude when u call to ask if u can pay a visit to their farm. I chance upon this website while trying to read up on yishun olden days being a former graveyard. I appreciate ur effort for these articles. Looking forward to your write-up. I would also like to see close-up photos (if available) of Teochew-style tombs. 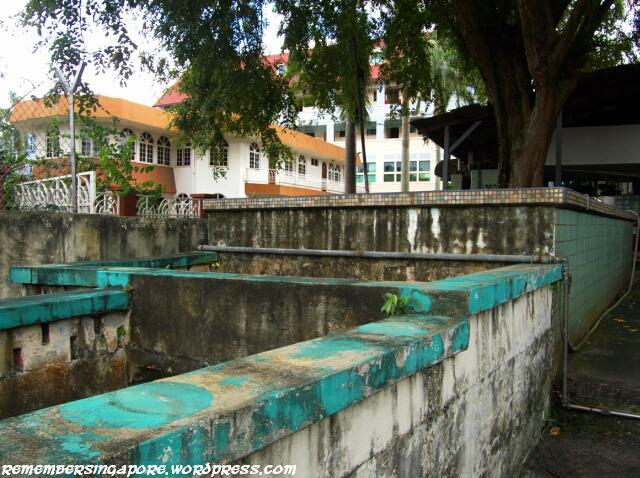 I’m curious if these vanished Teochew tombs from other parts of S’pore differ from those located at Bukit Brown. How is 广义山 pronounced in Teochew … Kong Yit San ? Is the site depicted in the above photo 广义山 cemetery ? Are the tombs Teochew in style ? To me, their sharp corners make them look quite different from the curvaceous Teochew tombs found at Bukit Brown. Also, NLB’s S’pore Infopedia (24 Dec 2004) states that along Plantation Avenue in the Serangoon district, there was “a cemetery known in Chinese as si phua pak tiong or ‘cut stomachs of the dead cemetery’ as most of the corpses buried here had undergone autopsies before burial”. Is the above a Teochew or Hokkien cemetery ? I’m not sure if “si phua pak tiong” is Teochew or Hokkien expression. Do you know the reason why it closed?? My Army Unit had a Cohesion Visit to the Crocodile farm just 2 years ago!! It is a pity that most of our historical places is gone one after the other. Such venue leaves a deep roots in our nation developing and it is can consider as one of our very own heritage site. I still can recall vividly that Tan Moh Hong Crocodile Farm was one of our training slides during my times as a taxi vocational licence trainer in the early 1980’s under the perview of Registrar of Vehicles (ROV), now currently is Land Transport Authority. This farm may be gone but may I wished the family of late Mr.Tan Gna Chua to lived harmoniously and closely bonded as a cohesive family. 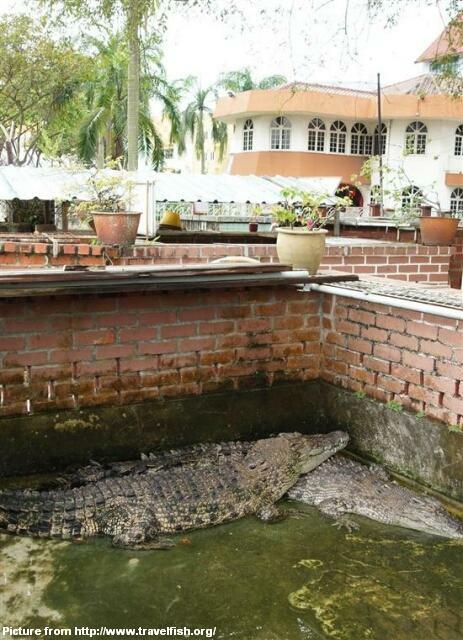 Frightened Punggol villagers asked police to protect them from a large crocodile. The 25-foot black reptile had first appeared near the shore in Punggol about two weeks earlier. Fishermen kept away from the area — one gave up fishing for farming after two of his sons had a close shave with the 600-pounder. Hunters with shotguns had fired at it, but the pellets “just (tickled) it”. The croc disappeared for a time, but re-appeared with a mate. The fishermen feared there were many more around. Just a quick update, the crocodile farm has just been demolished. It was there last week and this week… It’s reduced to a plot of land. Bye bye crocodile farm, you’ll always be this ‘mysterious’ place in my memory. I went to St. Gabriels (the original one) which was a block away from the crocodile farm shop in the late 1950s. 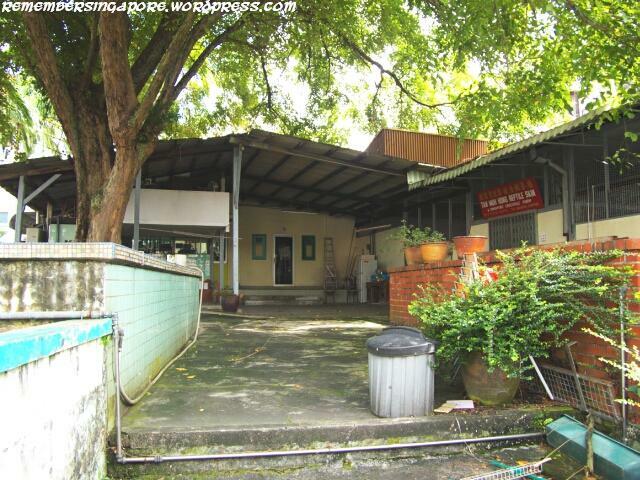 I never saw the farm itself as it was behind the shophouse. I found it on a google map again in 2004 but now I see it has been demolished. I am coming back to Sg in Dec from Boston and it is a great pity as everything on Google street view is totally different! 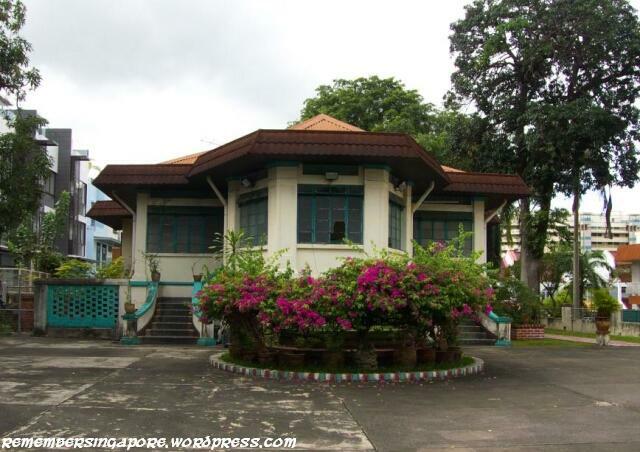 We used to live outside Serangoon Gardens on Chuan Hoe Avenue past the Japanese cemetery – it was in ruins then.